Yellowstone. The first national park. Serengeti of North America. Land of fumeroles, hot springs, and gurgling cauldrons. We’d been looking forward to the park for many reasons. 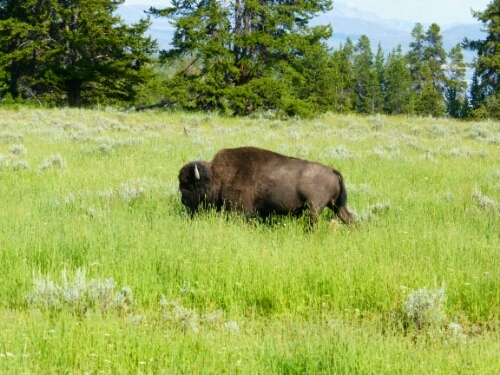 I wanted a quintessential summer in Yellowstone experience of seeing a bison jam. Gabriel has fond memories of road trips to the park. One with college friends and the other, riding his motorcycle to meet his sister and brother. Best of all, this stretch of trail, meant 24 hours with family. Michael and Olivia, Gabriel’s brother and girlfriend, planned their summer road trip to coincide with our hiking “schedule”. Seeing them really boosted our spirits amid a stretch of rainy days and damp meadows. Groceries, Smudge, and Lucy were also in the park and they camped a few sites away from us. Serendipity! We got to enjoy one last comfortable morning drinking coffee and eating ice cream in the cozy Marshmallow. Then they were heading north to Glacier, Waterton, Lake Louise, and finally back to Sky Dance in time for the Persede meteor showers of late August. It meant a lot to Gabriel and me to spend time with family. Bison jam! We were on route to cauldrons and dinner at the time. 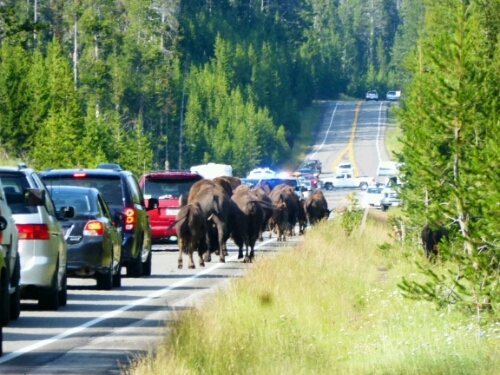 The bison jam lasted about 40 minutes, but they soon made it to the other side of the road. Gabriel and Michael. Note the family resemblance. 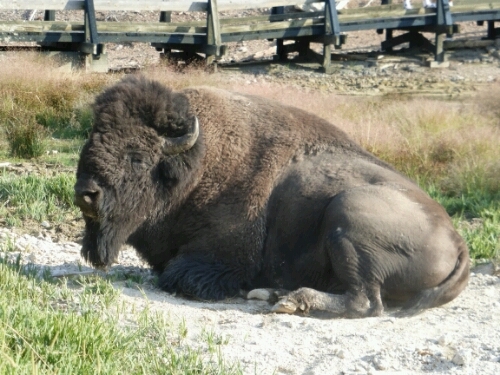 Bison lounge near the hot springs and seem to take little notice of the tourists. Gabriel and Olivia at dinner. 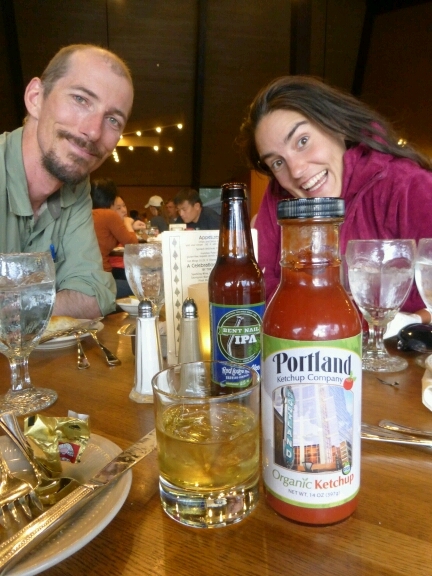 Michael and Olivia brought us a bottle of delicious Portland ketchup! Enjoyed it with dinner as well as a glass of Wyoming whisky. Oregon and Wyoming, the best of two worlds. 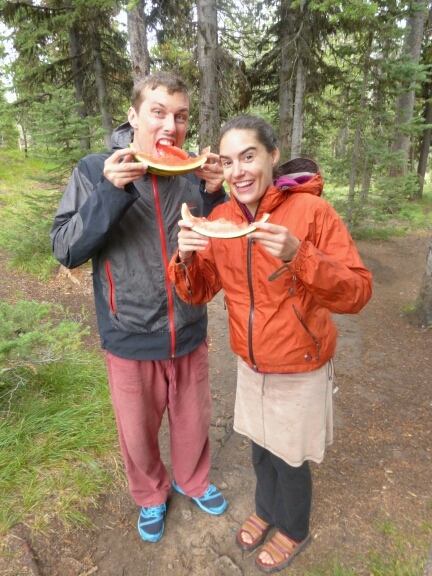 Michael and Olivia are enjoying watermelon in the rain! They brought us carrots, apples, and a New Seasons watermelon. It was delicious and juicy! And just about the only fresh food we&apos;d eat for 300+ miles. Many, many, mant thank yous to Michael and Olivia for driving us around the park and helping us prepare for next leg of our hike. 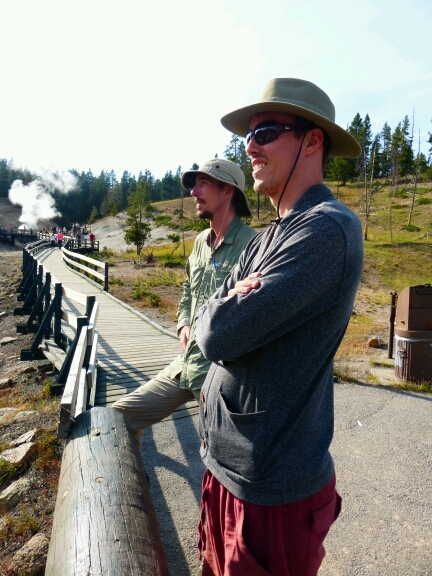 More accounts of Yellowstone mud puddles, geysers, and experiences to come.